Of all the centers. one has to particularly remember three. The Muladhara ( The Basic ), The Manipura ( The Naval), The Sahasrara (The Brain). The spinal cord at the brain, ends in a sort of bulb, in the medulla, which is not attached to the brain but floats in a fluid in the brain. If there be a blow on the head, the force of that blow will not hurt the bulb, that blow will be dissipated in the fluid. There are two sorts of actions in the nerve currents Ida and Pingala. One afferent, the other efferent, one sensory and the other motor, one centripetal, and the other centrifugal. One carries the sensations to the brain and the other, from brain to outer body. These vibrations are all connected with the brain. The center which regulates the respiratory system, the breathing system, has a controlling action over the system of nerve currents. Through the respiratory center, by breathing rhythmically, man rouses the coiled up power in the muladhara called Kundalini. When the kundalini awakes and rises step by step. It tries to force a passage through the canal. It enters the canal of Sushumna. Ida and Pingala are main channels through which afferent and efferent currents travel. When one is successful in passing the current through 'Sushumna' the canal in the middle of the spinal column, layer after layer of mind becomes open and man reaches the Truth. As the vast mass of energy stored up in a man, travels along the sushumna, it strikes all the centers mentioned above. As the 'Kundalini force travels from center to center, man perceives super natural divine wisdom. When it reaches the brain center, the whole brain tremendously reacts,the whole foundation of knowledge, opens up to the man. The Super Soul penetrates the subconscious and conscious mind and becomes visible in full luminous effulgence. It is my personal experience of feeling, tremendous sensations and vibrations like electric currents running through the brain to the rest of the body. Sometimes, it also results in nervous shakings. The brain or head heats upto the extent, that even application of ice is not sufficient to cool it. It is only by meditation concentration and pranayama, one can control it. In my personal case, it took me many months to control it by meditation and reciting 'Mahamrityuanjay Mantra' regularly on the beads of 'Rudarakash'. After a long practice in concentration, the heat in the brain turned into water or tears which over flowed through eyes endlessly for many hours. The blissful state, i felt after that experience is inexpressible in words or any other form. That ecstatic experience can not be defined in any way. It is to be only felt, by the persons in your presence. 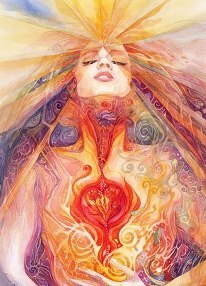 It is very essential to control the energy of Kundalini because if it moves outward, it will move in the material field and if it moved inward, it will move in the spiritual field. If it moves inward - the Unknown becomes known in the full blaze of illumination. Man attains the superconscious perception - realization of the spirit where the self becomes manifest. If a man is not fully aware of the science of Kundalini and its powers and does not know its utilization in right direction, his mind gets even deranged and confused which results in the shaking of head, nervousness, fits and faints, violence, dictatorship, egoism, Insomnia, madness, extremism, loss of memory,nightmares,hallucinations n schizophrenia.if any of these symptoms. Occur,he needs spirItual guidance. Sometimes man is born with roused kundalini.It is because he must have worked hard in previous birth and in present birth he becomes spontaneously enlightened from inner purity.The proof is The luminous light reflecting his face and body.It is advisable to such an illumined person to be strong enough to withstand all reactions.Super normal condition is hard earned so he should endeavour to stabilise himself by meditation.The constant practice of concentration bring mystical experiences.Kundalini is a mysterious vital energy dormant in body.When awakened it moves inward to upward.The power gained through rising kundalini must be transmuted from the achievements of mental powers into the upliftment of conscious state to cosmic consciousness.only then his motive becomes infinite to enlighten all with compassion and kindness.The perfection of human life lies in remaining one with Almighty and His creation. The human body is the greatest body in the Universe as he owns an intelligent mind with 'Intellect' as his genius.This gives him understanding to see things in right directions and attain to perfection. Perfection is every man's nature. All progress and powers are already in every human being. Only it is barred in and prevented by different organs and senses from taking its proper course. If anyone can take the bar off, the real nature and perfection rushes in. Man attains the powers which already belong to him. Wicked become saints as soon as the bar is broken. There is no doubt that Nature is driving every man towards perfection by reward or punishment. All the practices and struggles to become natural and spiritual, are to open the doors to one's own real self to attain perfection. Man must be master, not the slave of nature, body and mind. It is the human nature to take bad for the good and dream for the reality. Body is an unreal dream and the SOUL IS HIS REAL SELF. If one proposes to teach techniques to increase the power of sense enjoyments or to live a better material life, the human race easily and willingly respond to that. On the contrary if any spiritual authority undertakes to show the supreme goal, he finds few people to listen to him. In those, very few have the intellect or power or knack to grasp the higher knowledge of self realization. The body can be made to live for thousand years, the result in the end is same. When the living forces that hold the body, go away, the body must fall. No one can stop his body from changing as the age advances. Considering the realities of body and soul, to progress in life, man does not need to compete with anyone. Competition for life or social status are only unnecessary and extraneous efforts caused by ego and greed. When all competition cease the real nature behind a man, makes him go forward in right direction. Man's goal should not be to compete with human race, it should be the PERFECTION OF HUMAN RACE. This can only be attained by self realization because he will perceive within himself, a potential God, who wants to manifest Himself. Man is always doubtful about the things he does not see. He does not live upon words, so there is always a doubt in his mind whether there is any truth in these things or not. Simply listening to explanations and theories do not help him. Practice is absolute necessary. Practice will make him more experienced. The knowledge attained from man's own self experience will help him to reach the actual perfection of consciousness. The first part of this practice is physical, second is mental, and third the realization itself. The Supreme God can not be known by following particular set of rules and regulations of worship according to people's own nature. The purity of body and mind brings him closer to the confidential knowledge of God. Experience is the greatest teacher in man's life. We are passing through the time of Spiritual evolution. The Supreme power is gazing at us for spiritual transformation. Human survival is threatened on Earth due to division, violence and natural calamities. The basic source of human suffering and violence on Earth is ignorance and egocentric nature always in competition to prove superior. When someone is self obsessed it relates to his identification with his own body, emotions, thoughts, beliefs and concepts, In average natural state of consciousness, one is conscious of values and norms of family, society and country. The fanatical dogma of religion gets often defended in the name of God. Everyone recognizes God as one but Religions divide His creations on the name of race, culture , gender and age. Moreover Religion relates to external authority, rituals, devotional practice of divine codes. I believe that one's own temperament, experience, circumstances play a definite role in his self development. When one wants to seek release from inner pain and confusion, he determines to start his spiritual journey. Spirituality is about inner reality , inner state of being. It is a self learning and realizing Divine presence within. It is not Art of Living - it is Art of Self Transformation. Human being is so fortunate to have been endowed with capability to self perfect himself and discover the riches of Godliness within. I mention it strongly that Spiritual journey is not for weak, fickle minded. impatient - the one who demands quick results. The qualities of firmness, faith and devotion are solely required to follow the Spiritual path. The correct guidance keeps one away from errors and wasteful efforts. May all obstacles be removed from your spiritual path! Universe is made up of two basic things- Matter and Life Energy. Matter acts as a vehicle of life energy. What differentiates other live creatures from human form is that humans are bestowed with higher consciousness. This can be percieved by Kundalini Power which lies dormant in individual bodies in form of Kinetic Energy. By virtue of Pure Emotions, Right Knowledge and Spiritual Discipline, The Kinetic Energy activates to higher consciousness. One requires a Spiritual Attitude to awaken The Kundalini Power. By Yogic Techniques, Correct Posture, Devotion, Meditation and Mantra Chanting etc., one is capable of activating his latent energy to get linked up with his own nervous system. The foremost victory one has to attain in the process of awakening his own power- is the mastery over fluctuations of the mind and withdrawal from indulgence in the material world. The force generated by the fusion of Kundalini Power and different Psychic Centres creates great illumination and destroys the ignorance of mind. The whole concept of looking at things changes and the truth becomes visible in that state of Enlightenment. The Kundalini Power personifies in form of Goddess Durga when awakened Kundalini moves with great force and cross all the Psychic Centres in one leap. The Energy comes like a fiery storm and acsends to a highest centre in the Head where Mind and Kundalini Power unite bestowing The Divine Wisdom on Yogi. One who reaches to that point becomes Immortal in this physical body. One obtains victory over worldly desires and enjoys Eternal Bliss and Divinity in that superconscious state. This is exactly we inherit from the Supreme God by being our own real self called Sat-chit-ananda (Truth- Knowledge- Bliss).